This loyal penguin travels 5000 miles every year to meet his human friend. His Human friend who saved him from the brink of death, who is a retired old man and a part time fisherman. 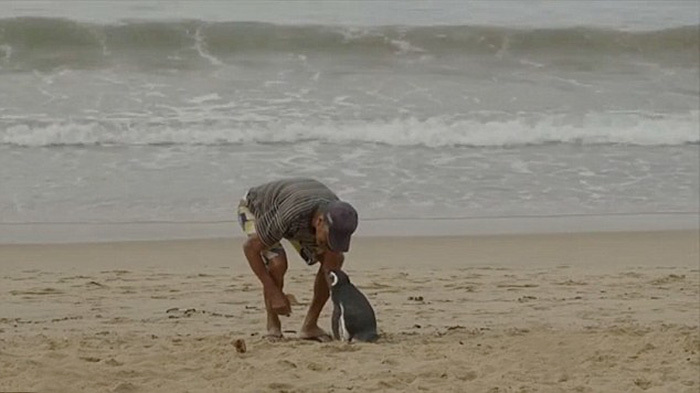 João Pereira de Souza is a 71 year old man who found this penguin starving,struggling covered in oil on a beach at Rio De Janerio, Brazil. The kind old folk then took action and nursed the penguin at his home, ensuring that he saved the little penguin’s life. Also he fondly named the penguin Dindim. And this is how this creature had his second chance at life. As selfless was his service for this animal, the old man left the penguin in the wild never to see him again. But this was not all. As nature would connect you to things as you could never expect. Just a few months later, the south american penguin found its way back to the Rio de Janeiro. This time around healthy as ever, the little penguin then tried to find his human friend. Also as nature would have it, the penguin somehow returned to the same beach, 8000 miles away from his actual habitat. And then Dindim followed the same man right to his residence successfully. After that Dindim spent 8 months with Joe and rest 4 months breeding on the coast of Argentina (about 5000 miles away from Rio De Janeiro) . The Old man was also quoted telling a Brazilian news channel, that he loved the penguin as his own child. And he also added that he believed that the penguin loved him too. What is surprising that the penguin pecks on anybody who tries to even touch him. As Joe would remark, only he is allowed to touch him. The penguin even spends time laying on the man’s lap and allows him to give him showers too ! And he even spends time with him and feeds him. And since that one visit, Joe’s little loyal penguin friend regularly visits Rio De Janeiro travelling 8000 miles from Argentina from the past 4 years. Every year now, the penguin pays his grateful visit in the month of February and stays till the month of June. Joe even quotes that this time of the year Dindim becomes affectionate and expresses his happiness on seeing the old man. This unique human-friendship story, where the old man saved penguin’s life surely melts our hearts. We hope you enjoy our posts as much as we enjoy publishing them. For more great content keep visiting the website. Do not forget to like share and comment. For our story on little puppy who get rescued from coal tar, visit here.